Punta Sur Eco Beach Park has something for everyone. 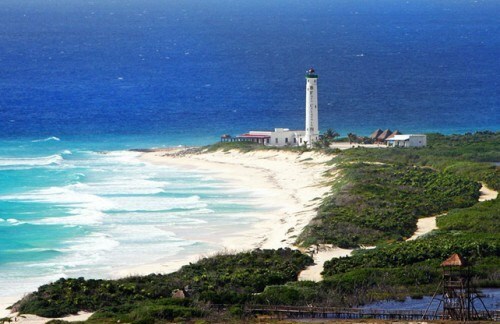 It is one of Cozumel´s natural treasures and should not be missed if you are taking a vacation in Cozumel. Punta Sur is an ecological reserve covering an area of 247 acres with beach areas, coral reefs, a lagoon and Mayan archaeogical site. Most of the pictures you will see of Punta Sur Park will be of the Celerain Lighthouse which also house the navigation museum. Within the Punta Sur Park you will find the Colombia Lagoon which is its main attraction. Punta Sur has interesting wetlands, a magnet for migratory birds in April and May, and home to lots of crocodiles year-round. It is also the home for nesting green and loggerhead turtles during the months of May to October. There are viewing decks and towers in many parts of the park where you can observe the creatures in their natural habitat and which are fabulous for taking photos. There are beaches both on the east and west coast of the park. The west coast is better for snorkeling and you will see many beautiful colourful fish very near to the shore. The beaches on the east also very beautiful but more rocky with sand dunes and are a designated protected zone for nesting sea turtles. If you are feeling enegetic you should climb the Faro de Punta Celerain (Celerain Point Lighthouse) and you will be greeted with amazing views. The lighthouse is also home to the navigation museum. You can also visit the tiny Mayan shrine to Ixcel, the fertility goddess, known as Tumba de Caracol, a unique structure with tiny shells embedded in the walls that whistle in the wind. Legend has it that this was to warn them of oncoming storms or hurricanes. We can help you to book a tour to Punta Sur or if you have a car or taxi you can get there yourself. We highly recommend you take a day to visit this natural beauty.